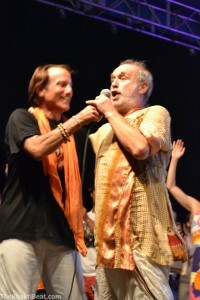 Krishna Das. Like a rock...star. The Bhakti Beat @ Bhakti Fest Midwest (June 30-July 1, 2012) The grand All-Wallah Finale has become a Bhakti Fest closing tradition. It’s also become one of those love-it-or-leave-it affairs, depending on who you ask. Over the course of attending five of them since 2010, we’ve observed a lot of mixed feelings about the inevitably raucous everyone-gets-to-be-a-wallah jam-out that officially closes out each Bhakti Fest. Some wallahs avoid it altogether, as Krishna Das has managed to for three years running at the West Coast Fest in Joshua Tree. But there he was stage center at the Madison, Wisc. fest, a pillar of maroon-shirted stillness in a sea of bhaktified motion, his gravelly repetition of the Maha Mantra standing out even amidst the cacaphony unfolding all around him. At least 50 musicians, yoga teachers, workshop leaders, staff and volunteers jammed the stage, dancing, leaping, twirling, and conga lining in ecstatic joy as everyone chanted as one. Bhakti Fest Founder/Executive Producer Sridhar Silberfein with Shyamdas. Sridhar Silberfein, the founder and executive producer of Bhakti Fest who is rarely seen on stage until this finale, poured out gratitude to his staff, the wallahs, teachers and everyone who made Bhakti Fest happen. He somehow maintained order in the chaos of celebrating the successful completion of The First Ever Bhakti Fest Midwest, assuring the cheering Heartlanders that Bhakti Fest would be back. Sridhar did a gratitude dance across the stage with one person after another. He sashayed with Shyamdas, rapped with Ishwari, got down low with DJ Lakshmi, and spun circles ’round Ragani. But when it was time to reach out his hand for KD to join him, KD wasn’t going for it. He responded — playfully of course — with a certain arm gesture that fellow New York native Sridhar was sure to understand. Did you catch that? Yeah, he gave him “the arm,” the Italian salute. We can’t prove it with a picture but we saw it with our own eyes. But Sridhar wasn’t about to give up. He pulled on KD’s arm while Ragani pushed from her seat next to him on stage. 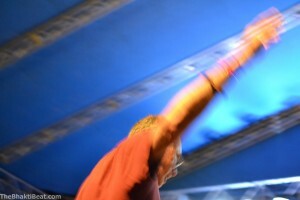 Finally, the kirtan rock star gave in, reluctantly rising to receive the thunderous approval of the crowd. He did not dance a jig across the stage. After barely a moment he gave a look to Sridhar that seemed to say, “Can we get this over with now?” and went back to his lotus, back to his chanting. Classic KD humor, legendary humility. 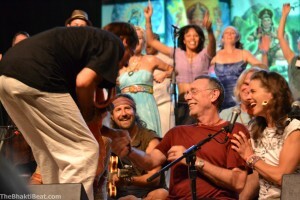 It’s moments like that that make us really glad we hung around for the Last Hari of Bhakti Fest. 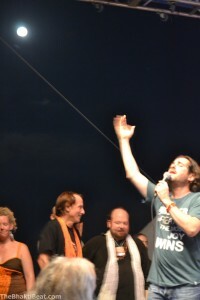 David Newman and the moon. And It’s because he is authentic. Yes. 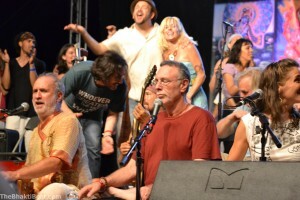 Krishna Das keeps it real.